FREE VIDEO – TOP CSA SUCCESS SECRET! « ROCK YOUR CONSULTATIONS, GET MORE MARKS! 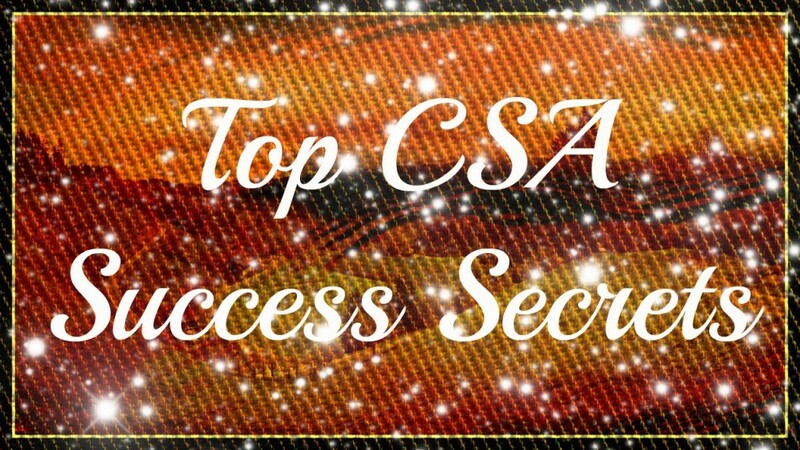 FREE VIDEO – TOP CSA SUCCESS SECRET! Home → ART OF CSA SUCCESS & MINDSET SECRETS → FREE VIDEO – TOP CSA SUCCESS SECRET! I’m thankful and honoured that you’ve allowed me to be a part of your life! The first part of this email is about me, but the second part is about you, so stick around and read through. Looking back, this year has been a year full of changes for me, both personally and in my profession. It hasn’t been an easy year but it’s been an amazing one. Behind the visible successes, there have been intense moments of breaking down (usually) privately. I’ve knocked down many personal walls – and then realized how much they were holding me back in profession. I’ve discovered things I do well, and things I don’t… and continue to be reminded that we’re all only human, doing the best we can, and to be gentle with ourselves and others. If we never try, we’ll never know what we’re truly capable of. I feel so blessed to work with YOU who inspire and motivate me. I love the difference you are making through your performance and brilliance at what you do, and the fact that you’re taking action and making things happen! And I’m surrounded by great family, loving patients, great colleagues, awesome trainers and fabulous mentors who constantly challenge me to step up in a bigger way, try new things, and continue the never-ending process of discovering who I am, what my purpose is, and how I can better serve to make a difference in this beautiful world. I can’t express how much their faith in me has meant this year. I’m energized by new things happening and what’s coming in 2013. But as much as our CSA SmartGroup continues to evolve, one thing remains the same. YOU are my inspiration to continue doing what I do. So here’s to you, My Friend. Thank you for reading my emails, visiting my blog, sharing your comments, and telling your friends. Thank you for sharing your own fears, goals, and beautiful successes in CSA with me in return. Your stories are so much like my own in so many different ways. I see the beautiful potential in us all, just under the surface for so many, waiting to shine in an even bigger, brighter way in the New Year. Yessssssss, Thank you for being part of my world. Let’s create an AMAZING 2013, full of good things, bigger dreams, helping more patients with lots and lots of Successes! I am here to help YOU as a leading learner and NOT as a teaching teacher! This video will briefly walk you through the importance of having the right MINDSET on your CSA Exam Day. Yes, Your Mindset will be THE DETERMINING FACTOR in YOUR SUCCESS. Right Mindset plays a vital role not only in CSA but also in your life! We will look into different topics like difficult patients, sexual health, women’s health, psychiatry etc…as you wished! Email me the topics you want to be discussed to csasmartgroup@gmail.com. Now, I DEDICATE THIS VIDEO TO MALALA YOUSAFZAI! AND SHE ASKED FOR NOTHING BUT EDUCATION…. BRAVE GIRL! I feel fortunate about the endless opportunities we have here. WE MUST SUPPORT EACH OTHER AND THRIVE! Share this GIFT with your colleagues and support each other to pass your CSA Exam. Welcome to DATE WITH CSA! It’s me Hema – Creator of CSA Smartgroup where we are dedicated to your success in your CSA exam. We are here today to find the CSA Success secrets to make a difference and move forward and pass your CSA exam easily. I can inspire you. But you are the one who can take the necessary actions and succeed. Otherwise, the inspiration without action is only an entertainment.OK… To those who do not know me, let me introduce myself briefly. I am Hema, one of the GPs from Yorkshire. I am not only the founder of CSASmartgroup.com but also the Creator of Royal Amore.com where we empower needy women and poor students to be financially independent through education and handmade jewellery making. I created the CSA Smartgroup… even before I took my CSA … JUST as a BLOG TO COLLECT ALL THE NOTES AND TIPS. When we reached more than 10,000 views in just 4 months, I moved on to make it a unique website to support you in your CSA Preparation with lots of eBooks called CSA Success Grenade and e-courses called CSA Rapid Success courses. I am blessed to be with you in your tough times and help you to pass your CSA EXAM. OK, Today we are going to look at the most important factor which determines your success on your big day. Can you guess it? Yes, you got some of them. Medical knowledge, clinical skills, language skills, BODY LANGUAGE are some of the important factors. They are the skill set which will help us to perform well. BUT do you how much it will play a role in determining your success? Will you be surprised if I say skill set plays about 10-20% in helping you to succeed on your CSA? NOW, you will be wondering what might be the 80-90% factor. Yes… IT IS OUR MINDSET. IT WILL DETERMINE 80- 90% WHETHER WE PASS OR FAIL IN CSA. Yes, I would call both Mindset and Skillset as the CHAKRAS OF CSA! We are going to see the Mindset little bit deeper today. Then in the following videos, we will dig into the skill set. What is Mindset? I will talk about it in detail in one of my e-Courses called Mindset Magic. Today I will discuss about mindset briefly. Mindset is like a TV set, when we change the channels, we can see different programmes. Mindset does the same. We see things the way our mindset have instructed us. We should have Clarity, Motivation, Focus, Plan and Strategies to pass our CSA. It is not easy. We need to overcome our fear/ frustration/ anxiety/ depression. Now, I am going to share with you some of the Strategies which help me to succeed in whatever I do. When we start to complain, we shift our attention from what we can achieve to what is wrong. This will drain our good energy. we must shift our focus to what we enjoy. Imagine reaching our goal. Hang around uplifting people. This will certainly increase our energy. 2. We need a Detailed Map to achieve your goals. we need to be honest about where are in order to get where we want to go. we also need a clear destination. So, A map allows us to track our progress. It lets us know if we are on track and whether we are going the right direction. A map gives you reassurance and perspective. Without a map, we will stay stuck where we are. You can download my free ebook called CSA Action Planner from our website. It’s easy to get discouraged and overwhelmed when preparing for CSA. Focus on taking the next step. This is especially true where it feels the most challenging. we want to make sure the next step is doable. Each step we take will build our confidence. And The goal is to keep moving and not stop. There are going to be obstacles but don’t let them stop you. You might have to wait and let the storm pass, but keep moving. Remember, Obstacles are opportunities for creative solutions. We need someone with expertise to be our guide. We need a guide who knows the way and has the practical skills to get you there where you want to go. We also want a guide who is encouraging and supportive. I have fabulous guides/ Trainers. Because of their expertise, I am able to do far more than I thought was possible. Find a guide who has the practical expertise to navigate you towards your goals. You will end up accomplishing far more than you thought was possible. If you take it step by step you can enjoy the scenery. Enjoy your life now, wherever you are. Now, I want to thank you for watching this video. If you are watching this video, I believe probably you have been struggling quite sometime in CSA preparation and you do not want to struggle anymore on your own. I am going to share my experience to help you dramatically not only in your CSA but also in your life and GP career. It is about realizing the value you bring in the lives of your patients. I am here to do that in a big way that increases your confidence and brings success in CSA along the way. We are here to help you. Remember, This is the moment, you get your confidence. And I am here to help you out. See you in our next video where we will discuss about important topics like sexual health, genetics, etc. Share with your friends and support them to pass their CSA.